In Taiwan, bonsai culture began in the late Qing dynasty. Taiwan's oldest living bonsai is a 240-year-old banyan that resides in Tainan's Kaiyuan Monastery (開元寺). Yet it wasn't until the 1980s that bonsai cultivation in Taiwan reached maturity. In 1984, a 13-part series titled The Art of Chinese Bonsai in Taiwan was broadcast on public television. 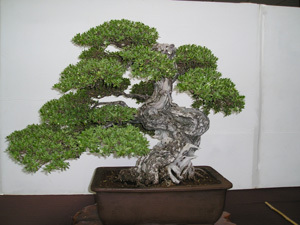 The series was a huge hit and it set off a nationwide bonsai craze. Up to 150,000 people started growing bonsai and bonsai associations popped up in cities and counties from Taipei to Yunlin to Kaohsiung. Today though, the numbers have dropped a bit, there are between 10,000 and 20,000 bonsai growers registered with an association, and a total of about 100,000 unregistered growers. Taiwan is an agriculture-oriented country and with its humid sub-tropical weather is good for growing many species of plants as Bonsai. This allows bonsai enthusiasts to be creative and competitive in local exhibitions, and bonsai masters are continuously improving their skill to create great and wonderful bonsai. In 1994 the Bonsai Association R.O.C. 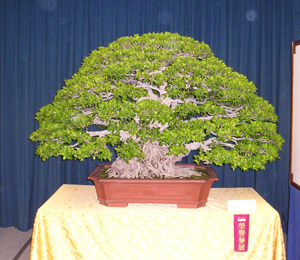 was formed and is a national bonsai organization that was organized by Taiwan bonsai lovers. Now, Bonsai art in Taiwan has reached a very high level and a lot of overseas collectors are very interested in Taiwanese bonsai techniques and materials. We hope, with efforts from all of our members, bonsai art in Taiwan could be introduced to all the other countries and friendship could be developed through sharing common interest in bonsai.